It might be the shortest month of the year but that doesn’t mean that there is less to do! Whether you’re looking for weeknight activities to do with friends or weekend activities that will be fun for the whole family, you can find them in Central Ohio. Here are a few events going on near you this month. What: On the first Saturday of each month, thousands of visitors converge on High Street in the Short North Arts District for Gallery Hop. Though many shops and galleries are open earlier, Gallery Hop officially starts at 4 p.m. and runs to 10 p.m., with restaurants and bars staying open considerably later. With dozens of galleries and non-traditional exhibit spaces, its Columbus favorite night of the month to celebrate art. What: The Tenderloins are a New York-based comedy troupe, whose four members – Joe Gatto, James Murray, Brian Quinn and Sal Vulcano are the creators, executive producers, and stars of truTV’9s hit series, Impractical Jokers. Currently in its 5th season, Impractical Jokers follows the guys as they coerce one another into doing public pranks while being filmed by hidden cameras. This season takes dares to outrageous levels with a whole new arsenal of over-the-top hijinks, bringing the show and guys to new locations and setting each other up for some of the most uncomfortable antics yet. Their highly successful tour, the truTV Impractical Jokers’ ‘Santiago Sent Us’ tour starring the Tenderloins, is a mix of stand-up, never-before-seen hidden camera videos, stories, and insights. The tour has crisscrossed the country playing to 2000-8000 people per market. For more information, visit thetenderloins.com or ImpracticalJokers.com. Ages 16+ recommended. What: Columbus Blue Jackets Winter Park presented by Worthington Industries is a three-week long celebration of the winter season at McFerson Commons across the street from Nationwide Arena. The outdoor community rink is open throughout the month of February for public and private skating sessions and is equipped with bleacher seating, a skate rental tent and four heated locker rooms. Additionally, there will be a tall tubing hill towards the front of the park. What: Come cheer on the Columbus Blue Jackets! The only National Hockey League franchise in Ohio, the Columbus Blue Jackets play at Nationwide Arena, located in the heart of the Arena District in downtown Columbus. What: This triumphant hit musical is the recipient of six Tony Awards, two Olivier Awards, a Grammy, thousands of standing ovations, and is now the #1 longest-running American musical in Broadway history. Chicago has everything that makes Broadway great-a universal tale of fame, fortune, and all that jazz; one show-stopping song after another; and the most astonishing dancing you’ve ever seen. The production holds an added punch of hometown pride as former NFL legend, OSU superstar, and Heisman Trophy winner Eddie George makes his Columbus stage debut as the fast-talking lawyer Billy Flynn. What: Little Big Town announced they will bring their critically-acclaimed harmonies to Columbus with The Breakers Tour featuring special guests Kacey Musgraves and Midland. What: Kid Rock announced that he will hit the road on his “American Rock n Roll Tour 2018,” produced by Live Nation. The tour kicks off on January 19 in Nashville and will continue with 21 shows from coast to coast including a Saturday, February 17th show at Nationwide Arena. Fans of the rocker can expect the same high-energy experience with brand new tracks from his latest album. What: Experience your first taste of spring and get a head start on your next home-improvement project with the Columbus Dispatch Home & Garden Show. Meet with hundreds of experts and professionals, walk through lush, decked-out gardens in full bloom and pick up endless tips to beautify your home — inside or out. It’s two buildings’ worth of home and garden-related fun! What: This show is general admission for all ages. The show will be indoors at the Express LIVE! Pavilion sponsored by WCOL. Doors will open at 630PM. The Price is Right – LIVE! What: The Price Is Right Live is the hit interactive stage show that gives eligible individuals the chance to “Come On Down” to win. Prizes may include appliances, vacations, and possibly a new car! Play classic games from television’s longest-running and most popular game show…from Plinko- to Cliffhangers- to The Big Wheel, and even the fabulous Showcase. 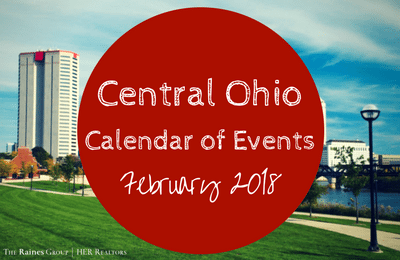 For a full list of things to do in Central Ohio this February visit the Experience Columbus website!